Finding out that the IRS has issued a tax levy or wage garnishment against your bank account or wages can be a terrifying discovery for any taxpayer. How will you pay your bills? How long is the levy going to last? Who do you contact to get the levy released? Once a levy has been issued, time is of the essence in getting the levy released. If a levy has been issued against your account, it is highly advisable to speak with a tax expert to determine what your resolution options are and to stop the IRS garnishment. There are many things that you need to know regarding how to stop an IRS levy. One of the first things you need to know is that the IRS is not going to warn you that they are issuing a levy. The IRS has a series of notices that it is required to send to a taxpayer before they can issue a levy. However, once these notices have been sent, the IRS can issue a levy against your bank accounts or wages at any time in the future. Many taxpayers are under the impression that the IRS will notify them before issuing a tax levy not realizing that the first time they will be notified of the levy will be from either their bank or their employer after the notice of IRS levy has been issued. There are two main ways that the IRS can seek to enforce collection of your back taxes. One is through an IRS levy and the other is through a wage garnishment. An IRS levy is generally issued against a bank account and a wage garnishment is issued against your wages or income. It is important to know what type of levy or garnishment that you have in order to understand how it is going to affect your finances and what needs to be done to have it released. An IRS levy that has been sent to your bank is a one-time levy that attaches to all the funds in your account up to the amount of the levy. The levy itself will show the amount that the levy is for and where the levy was issued from. A levy sent to a bank is not account specific. It will attach to all accounts connected to your social security number. If you are on a joint account with your spouse or your children the levy may also attach to any money in these accounts. Once the bank receives notice that a tax levy has been issued, they will freeze the amount in the account and hold it for 21 days before sending the funds to the IRS. For a wage earner, an IRS wage garnishment is sent to your employer and attaches to your paycheck. Unlike a bank levy, this is a continuous levy and will continue to attach to your paycheck until it is released by the IRS. If you are self-employed the IRS will still issue a levy. Like a bank levy, this is a one-time levy that is sent to vendors and third parties that pay you for your work. Upon receipt, your employers must send any funds owed to you to the IRS up to the amount of the levy. The IRS can continue to issue additional levies until resolution is established or until the balance is paid in full. What can you do once you have received an IRS levy? 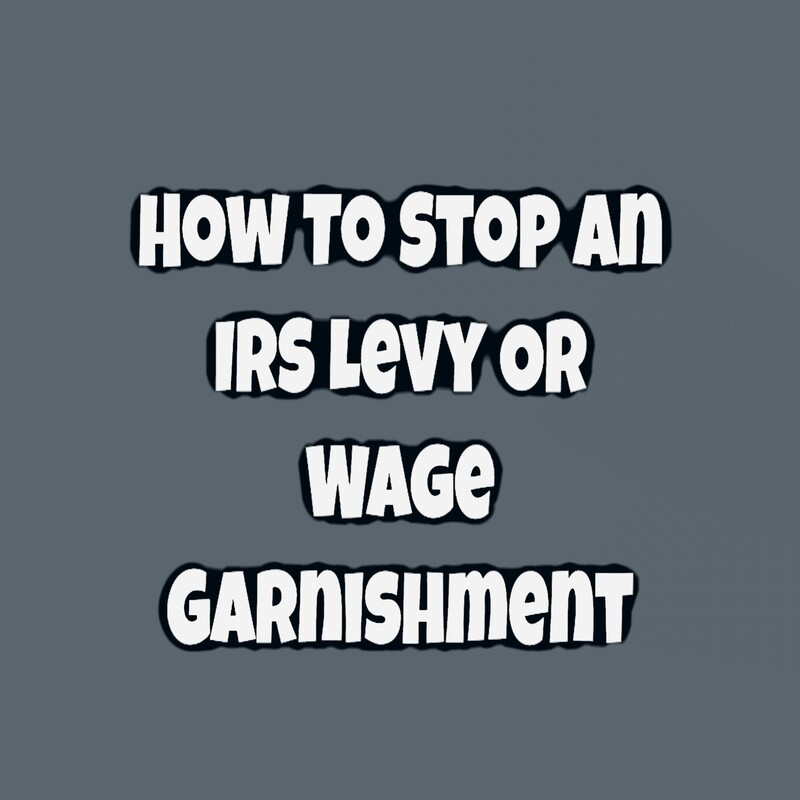 How do you stop an IRS wage garnishment? You need to act right away to get the levy released. The IRS is going to require many things in order to approve the release of a levy. For a one-time levy, you will need to show that there is a financial hardship to the IRS taking the money from your bank account or show that the money is allocated for necessary living expenses. For a wage garnishment, the IRS will generally require you to have all required tax returns filed and show that you are in compliance with your current tax filings. They will also require you to provide your financial information. From this information, they will set-up resolution on your account and release the levy. You will want to make sure that you have a fax number for your payroll department or bank when you call the IRS. That way, when the IRS releases the levy or garnishment, they can fax the release instead of mailing it. Also, make sure you know when your payroll department runs payroll, so you can get the levy release to them before they run payroll and send the levy to the IRS. A levy and wage garnishment are not intended to leave you with enough income to live on, nor are they intended to be permanent resolution on your taxes. Instead, they are meant to force a taxpayer to get into contact with the IRS and get a resolution plan established. As with anytime you are dealing with the IRS, it is highly advisable to seek the assistance of a tax expert. However, when you trying to stop an IRS levy or wage garnishment, it is even more important to have someone who knows the ins and outs of the IRS. Once the funds from a levy have been sent to the IRS, it is very difficult and unlikely that you will get the money back. You do not want to waste time attempting to deal with the IRS yourself only to have the money you need to pay rent being sent to the IRS. Once a levy has been released, you need to make sure to follow the terms of your resolution. Failure to file your returns or timely pay your taxes may result in the IRS issuing new levies. If you owe back-taxes and the IRS has issued a tax levy or wage garnishment against you, contact Austin and Larson Tax Resolution. Our team of tax experts will represent you before the IRS and assist you with getting the tax levy or wage garnishment released.